Edit (June 2015): Addressing this problem is a brief project report from the Illinois Geometry Lab (University of Illinois at Urbana-Champaign), dated May 2015, that appears here along with a foot-note saying: An expanded version of this report is being prepared for possible publication. Below is an excerpt (though, to be clear, this question on MO is about finding a closed-form solution; moreover, (a) the main finding in part i agrees with an earlier MSE response, and (b) I have relayed the typographical error of "math.overflow.net" to the write-up's corresponding faculty mentor). The following problem was brought to my attention by a doctoral dissertation on Mathematics Education, but - as far as I know - the solution remains unknown. I have already asked this question on MSE, where the post has garnered over 90 votes, but still no canonical answer in the more-than-a-year since it has been there. Please add or suggest different tags if it seems warranted. Randomly break a stick in five places. 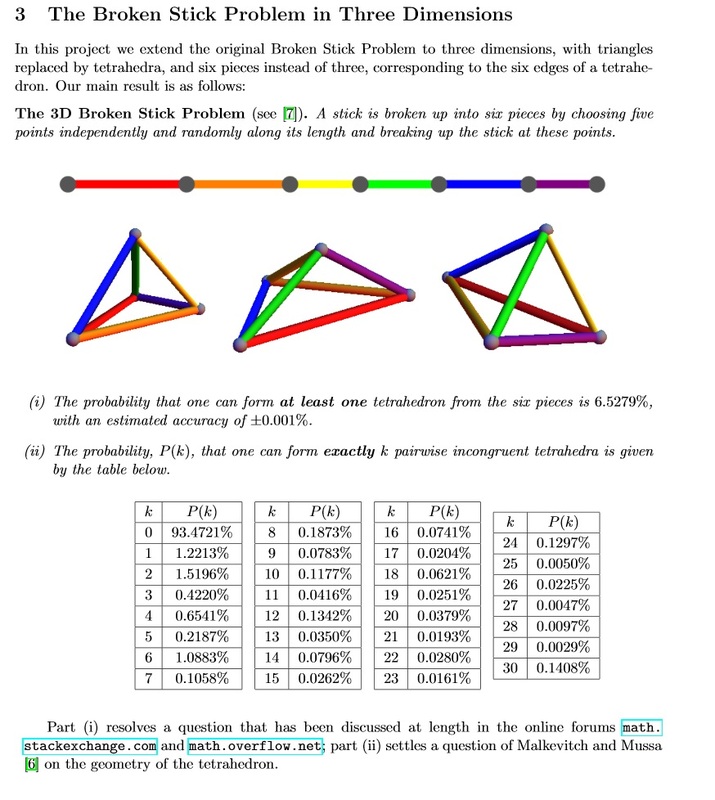 Question: What is the probability that the resulting six pieces can form a tetrahedron? Clearly satisfying the triangle inequality on each face is a necessary but not sufficient condition. Obviously, this problem is far harder than the classic $2D$ "form a triangle" one. I would welcome any progress on finding a solution or a reference to one if it already exists in the literature. This is far from a complete answer, but it may be helpful progress. The marked problem, where the numbers are labeled, looks much simpler than the unmarked version. The region of lengths which can be assembled into tetrahedron in some order can be viewed as a union of $6!$ copies of the region for marked lengths, although this can be reduced by the symmetries of the tetrahedron. So, let's look at the simpler case of marked lengths. There are linear conditions from the triangle inequality on each face of the tetrahedron, plus one quadratic condition from the positivity of the square of the volume. Ignoring the quadratic condition gives us an upper bound on the probability the edges form a tetrahedron. The collection of $12$ triangle inequalities and one equation, that the sum of the lengths is $1$, produces a $5$-dimensional polytope $P$ which I analyzed with the help of qhull. Given the simplicity of the result, perhaps there is a way to read off the structure more directly. There are $7$ vertices. Four of these vertices give $1/3$ length to the $3$ edges meeting at a vertex, and $0$ length to the other three edges forming a triangle. Three of the vertices give $1/4$ length to a cycle of length $4$, and $0$ length to two opposite edges. If the tetrahedron includes faces with lengths $\lbrace a, b, c \rbrace$ and $\lbrace a, d, e \rbrace$ then the vertices include $(0, 0, 0, 1/3, 1/3, 1/3)$ and $(0, 1/4, 1/4, 1/4, 1/4, 0).$ With only $2$ more vertices than the dimension, the combinatorial structure of $P$ is relatively simple, and is determined by the fact that the convex combination (in fact average) of $4$ vertices equals a convex combination of the other $3$ vertices. Much as the bipyramid in $3$ dimensions can be triangulated with either $2$ or $3$ tetrahedra, $P$ can be triangulated with either $3$ or $4$ symmetric simplices. $P$ is related to the normal disks in a tetrahedron. The volume of $P$ is $1/54$ of the volume of the simplex of edge lengths summing to $1$. This gives an upper bound on the probability that breaking a stick into marked lengths produces the edge lengths of a tetrahedron, although this is far from the $1/79$ observed numerically by Kirill. It is interesting that the quadratic condition rules out a large fraction of the lengths which satisfy the triangle inequalities. I think the quadratic condition can be added by considering how the surface intersects the tetrahedra of one of the triangulations of $P$. This is much simpler than taking the intersection of a quadratic inequality with an arbitrary polytope. Not the answer you're looking for? Browse other questions tagged reference-request pr.probability mg.metric-geometry mathematics-education euclidean-geometry or ask your own question. If you break a stick at two points chosen uniformly, the probability the three resulting sticks form a triangle is 1/4. Is there a nice proof of this? What is the probability that these four random areas can yield a tetrahedron? What is the probability that all numbers in a set P are unique and each number in P is chosen randomly between 1 and n^3? How can I randomly draw an ensemble of unit vectors that sum to zero?